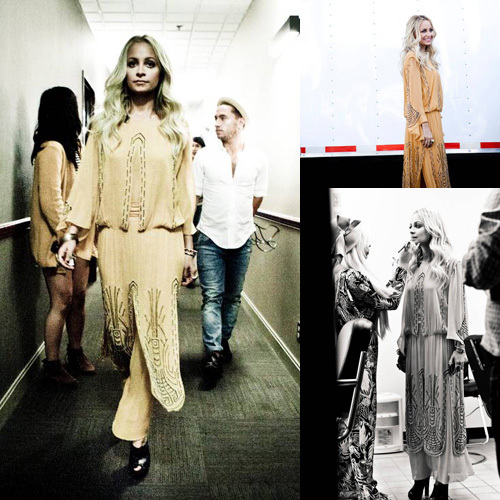 Nicole Richie wowed the Fashion Star viewers with another set of amazing outfits on last nights episode. Nicole wore an elephant print jumpsuit from her S/S12 Winter Kate collection, you can shop the 'Neela' jumpsuit at The Trend Boutique. Nicole Richie also wore a vintage jewelled dress on the show. We just love seeing Nicole's Fashion Star Looks! For those of you who missed the latest episode of Fashion Star CLICK HERE to watch online. I love the show BUT, i think they should show more of the mentors, the advices they give and more of the designers choices when they are at the design studio. And my favourites are Ross, Orly, Nzimiro and Kara. I agree!! I was hoping to see more of the whole designing process-like where they get their inspiration from, picking the right fabric, fittings.